FRP Gratings, FRP Gratings manufacturers, Molded Gratings, Pultruded Fiberglass Grating, Gujarat, India. FRP Grating is also lightweight and easy to cut, making installation easy and inexpensive. ACL’s W-clip provides a solid anchor point. While eliminating tripping hazards associated with higher profile fasteners. Our FRP grating is available in a wide range of surfaces, colors and styles (mesh pattern, thickness and panel size). We have a selection of UltraGrate Fiberglass Grating for almost any structural application! Gritted top for applications where maximum wear resistance and skid resistance is required. 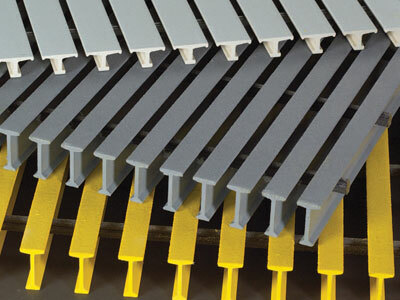 UltraGrate grit is embedded in the resin layer – not glued on – for greater durability. If you desire a completed fiberglass system, contact sales. UltraGrate Fiberglass Grating is a hand lay-up composite of resin and continuous glass fiber strand that is thoroughly wetted out and woven through an open mold. This method provides Lalita Fiber Molded Grating with good strength and high corrosion resistance. UltraGrate Fiberglass Grating is an excellent alternative to metal grating where rust, corrosion, or chemical attack are problems. With proper resin selection, UltraGrate Fiberglass Grating is an economical option in a wide range of corrosive environments. UltraGrate Fiberglass Grating is a candidate material where there are safety concerns due to the presence of liquids and oils on the floor as well as corrosive environments where chemical resistance of the flooring material is important for long term durability.